To make the dough, measure yeast into a large mixing bowl. Add the water and allow to sit 3 minutes. Add remaining ingredients, stirring in flour until mixture begins to form a dough. Turn out onto a clean surface and knead dough until smooth and elastic, about 8 minutes. Lightly grease another large clean bowl with a little bit of olive oil. Place dough into bowl, turning to slightly grease and then cover the top of the bowl well. I usually cover the bowl with clear plastic wrap, then place a large rubber band around the rim to affix it. Place dough in a warm sunny spot and allow to rise until doubled in size, about 2 hours. To make the sauce, heat oil in a saucepan over medium-high. Add onion and garlic to the pan and saute 5 minutes. Add tomatoes and remaining ingredients, lower heat to medium, and cook another 10 minutes, stirring often. Remove from heat and set aside. Once dough has doubled, preheat oven to 500 degrees. Carefully turn dough out of bowl onto a clean, lightly floured surface. Cut dough into two equal pieces. Place one half back into the greased bowl, leaving the other out. 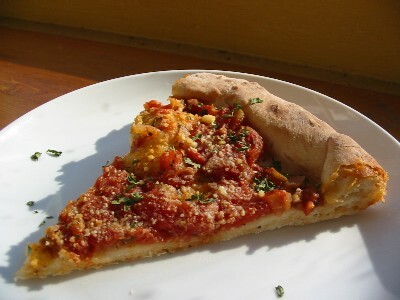 Wipe down the surface of a pizza stone or pizza pan with olive oil, then dust very lightly with corn meal. Pick up dough and gently begin stretching to form a circular crust. Place onto the pan or stone, and continue stretching until crust is about 12 inches in diameter. Turn the edges over and press down to form the sides of the crust. Place pan or stone onto the bottom rack in oven and bake for 5-7 minutes. Remove from oven, then spread half of the tomato mixture on top. Sprinkle 1 T. parmesan cheese over top, then place on top rack in oven and bake an additional 5-7 minutes, until golden brown. Repeat process with remaining dough and sauce. Allow pies to cool slightly before slicing and serving. Tastes great warm or cold.